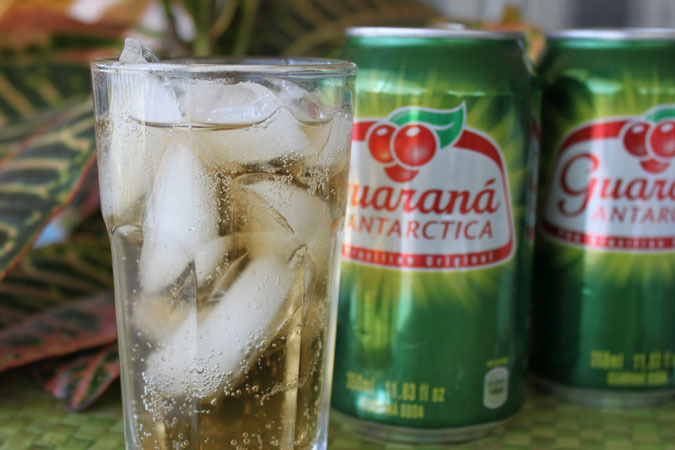 The caipirinha may be Brazil’s national cocktail, but Brazil’s national drink is a carbonated, caffeinated quencher known as guarana soda. Brazil’s guarana soda industry dates back to 1907, and today is Coca-Cola’s fiercest competitor. 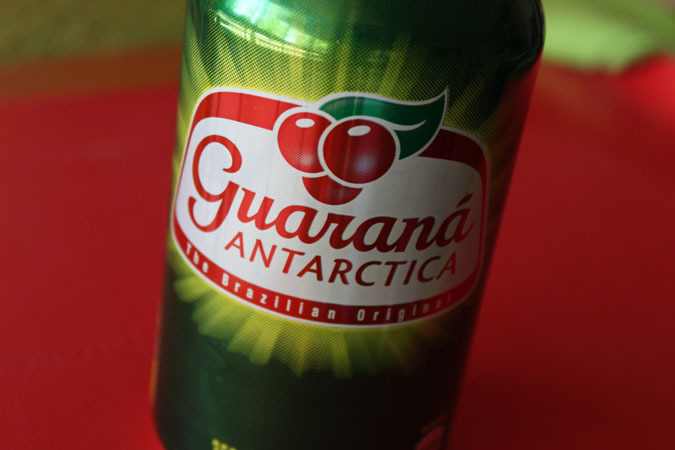 Guarana Antarctica is the leading big-name brand, but collectively hundreds of smaller brands, many regionally made, make up more than 50 percent of Brazil’s soft drink market. The guarana plant itself is more than just a caffeine buzz. It’s a symbol of Brazilian history and pride. It’s also an economic boost, since guarana production helps supply the worldwide energy drink industry with caffeine, which in this case is known as guaranine. So where does guaranine come from? The substance hails from the seeds of the guarana plant, hence the name. Native to the Amazon basin, guarana vines bear clumps of grape-size, Christmas-red berries and can climb as tall as 35 to 40 feet. 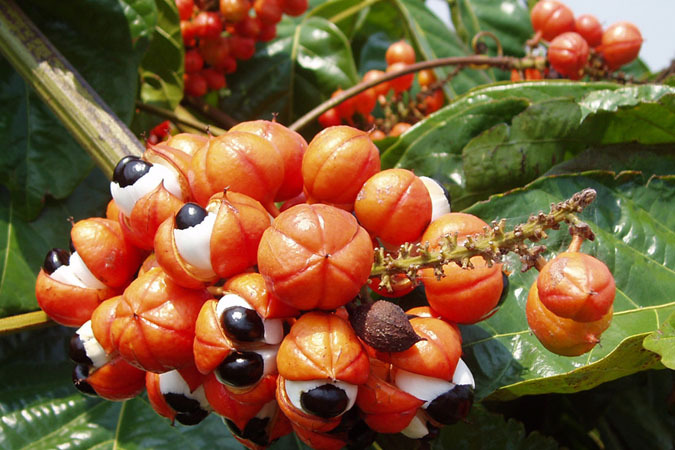 When the three-sided guarana fruits ripen, the capsule splits to reveal a black seed poking out of a white aril – they look like arm-length clusters of Muppet eyes. (Native legends say that the first guarana plant sprouted from the eye of an infant god.) Essentially, the seeds are dried, ground, and brewed into tea or processed as an extract. But how the Amazon tribes cultivate, process and use guarana is far more interesting, as my post on The Children of Guarana explains. Commercially grown guarana may not meet the tribal natives’ gold-standard of quality, but it still packs a power punch. Throughout South America, it’s made into guarana-based sodas that tingle the taste buds with their spicy, berry-like flavors. Variations now inundate the North American market. You’ll find guarana in Bawls, Monster, Rockstar, Full Throttle, and other energy drinks, and in many energy shots. And speaking of Coca-Cola: The global beverage giant now bottles its own pink, bubbly, bubble-gum-tasting soda known as Guarana Jesus – which is not some weird holy drink, but rather it’s named after its inventor, Jesus Norberto Gomes (a pharmacist who created it in 1920). For more about guarana, check out the Guarana Profile in Caffeine Basics.